Chikmagalur is known as the ‘Coffee Land’ of Karnataka. I have been to many destinations and explored tea plantations in India. However, I had never visited the place from where my favourite beverage originate. Because of this, Chikmagalur had been on my ‘to visit’ list for a long time. Chikmagalur is one of the famous cities in Karnataka and other famous cities in Karnataka include Bangalore, Coorg and Mysore. Karnataka tour packages are the best way to explore these beautiful cities. So, one extended weekend, I decided to visit Chikmagalur to check out the attractions it had to offer, along with the vast coffee estates. To reach Chikmagalur, we had booked KSRTC bus from Bangalore. The bus takes 4 hours to reach Chikmagalur and the price is Rs 441 per seat. We had booked seats in Airavat bus, owned by KSRTC. The Airavat bus is a Volvo bus, good enough to reach Chikmagalur comfortably. On day 1, we reached around late afternoon. We decided to relax and explore the surrounding area. On day 2, we decided to go for a day trip covering select attractions in Chikmagalur. The must visit was Mullayanagiri peak which is the highest peak in Karnataka. Apart from that, we wanted to cover Kalahatti waterfalls & Hebbe Waterfalls which are the major attractions in Chikmagalur. But, we dropped Kalahatti waterfalls as Hebbe seemed better. 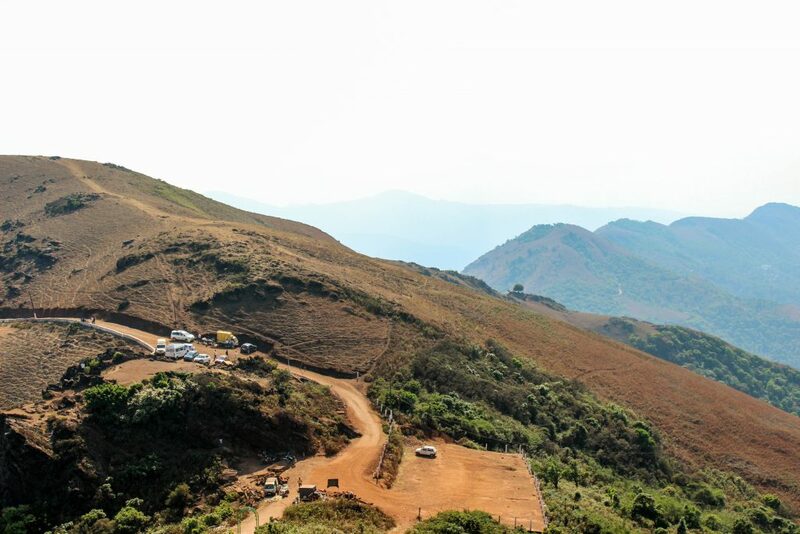 We hired a cab for Rs 2,500 and planned the Chikmagalur itinerary. First, we went to Mullayanagiri Peak, the best attraction in Chikmagalur. The Mullayanigiri is the highest peak in Karnataka and the view from the top is spectacular. The trek is not strenuous. The car can go right to the top and after that, you just need to climb 500 steps to reach the topmost viewpoint. After admiring the spectacular view, we headed towards Hebbe Falls. Hebbe falls is located at a distance of 20 km from Mullayanigiri. To reach the falls, you need to hire a Jeep. If there is a crowd, you might have to wait for an hour in order to get a Jeep allocated. However, the crowd is seldom very high here and we were lucky enough to get our Jeep within 15 minutes of us reaching the gate. Soon, our Jeep engine jolted to ride and we were traversing on rough roads, admiring the enchanting landscapes surrounding us. After riding on the dust covered roads, we were able to reach Hebbe Falls. The water splashes on the ground from a height of 168 meters. 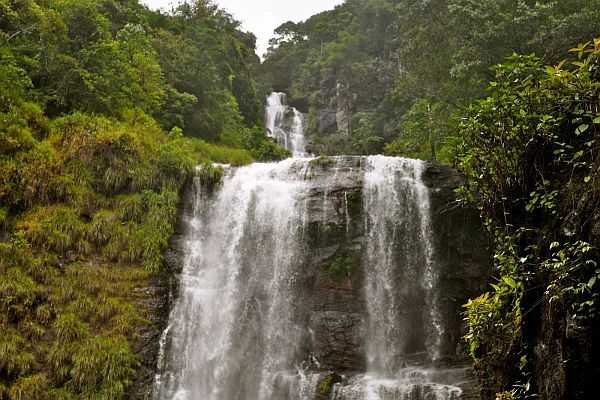 Unlike most waterfalls, Hebbe falls has water throughout the year. We were able to swim in the cold waters as we visited here pre-monsoon. I doubt if swimming would be allowed during monsoon. 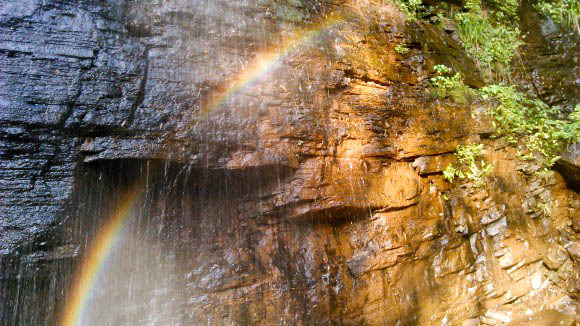 As we were admiring the magnanimity of the falls, we realised that a rainbow had been formed. The setting sun had penetrated the water droplets and formed a beautiful spectrum of colours. This was the closest I had been to any rainbow. We spent around 1 hour at Hebbe Falls and started our trek back. We took shortcuts to experience some extra dose of adventure. Finally, we were able to reach where our car was parked. We savoured some delicious omelette with coffee. As the sun was setting, we started our way back to the Chikmagalur Homestay where delicious dinner would have been served already. On day 3, we had planned Kemmanagundi. Located 60 km from Chikmagalur town, our morning drive to Kemmanagundi was lovely! 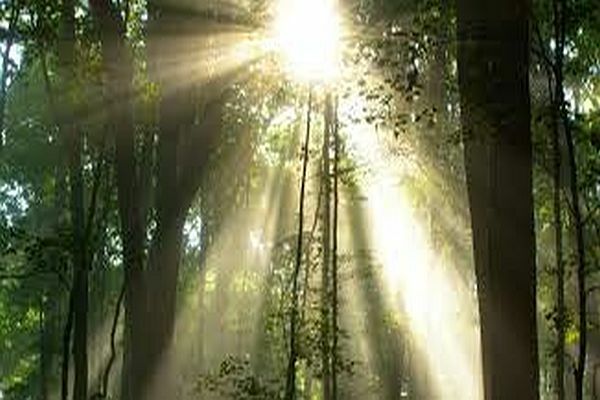 As the sun scattered rays through the net of tree leaves, we revelled in the morning’s beauty. We reached rose garden In Kemmanagundi, but before visiting the garden, we decided to explore a narrow path which vanished in the adjacent forest. We kept walking for 2 hours and reached in the denser part of the forest. The early afternoon sun illuminated the dense forest and we could see streaks of sun rays making their way through the dense trees. We reached a point where the narrow path disappeared. We relaxed near a tiny stream passing through the rocks. Later, we started walking back towards the rose garden. When we reached the garden, it was already evening. As the twilight shades dominated the sky, we indulged in some photography experiments! 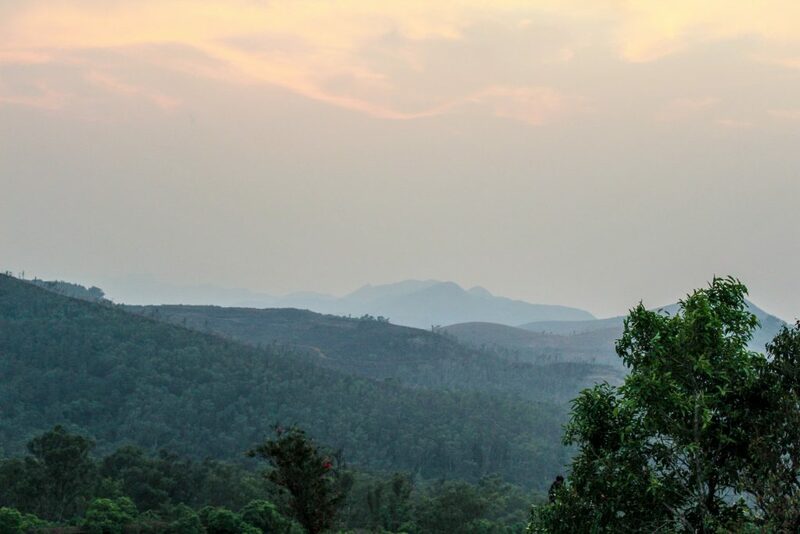 We headed back to our Homestay in Chikmagalur as the Sun began its journey towards the other side of a globe. On the 4th day, as the breakfast was being served, we decided to explore the coffee estate where our Homestay was located. It was interesting to know about how my favourite daily beverage is grown, nurtured and processed. Coffee plants are of two kinds – Arabica & Robusta. While there is not a lot of difference between these two for a layman, the coffee state owners prefer one of these varieties according to their needs. While Arabica coffee plants are smaller in size, Robusta coffee plants are larger. Moreover, Arabica needs more manual maintenance as compared to Robusta. Accordingly, a coffee estate owner decides which variety of coffee beans to cultivate. The cycle of accumulating coffee beans lasts for a year. The estate owners get yield once in a year around Dec-Jan. If you want to see a coffee plantation in its true magnificence, visit a coffee estate in Dec end or Jan beginning. It is post that when the plucking of coffee beans is done. You will be able to see a massive presence of reddish brown colour in the estate due to coffee beans. After plucking the coffee beans manually, peeling of skin is done by a machine. Post peeling, the seeds are dried in sun to evaporate all the moisture. Once the seeds are dried, bags are filled to the capacity of 50 kg per bag. These bags are bought by vendors based on the current coffee market rate. After collecting the bags, these vendors roast the seeds and subsequently sell them to players like Nestle. Coffee being a commodity witnesses variations in the market prices on a day to day basis. Brazil plays the most important role in influencing the global coffee price. India stands at 7th position in Coffee production. After exploring the coffee plantation, we relaxed and spent some quality time. We had sumptuous lunch before leaving the Homestay. We caught the bus for Bangalore. Bangalore holiday packages give you a chance to explore the blessed, benevolent and cosmopolitan city of Bangalore. However, our experience in Chikmagalur had been more than magnificent! Have you been to Chikmagalur? What was your experience? Do let us know in the comments below. Chikmagalur is known as the ‘Coffee Land’ of Karnataka. 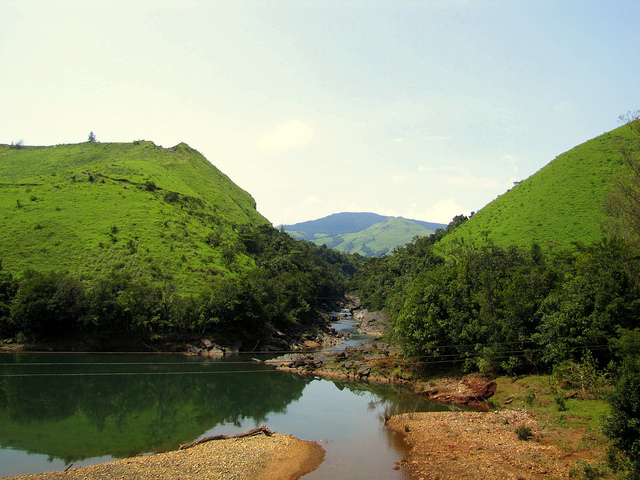 Explore Chikmagalur and check out the attractions it has to offer. "Umang is a travel blogger and writes his travel stories at Travelmax.in. You can find stories revolving around adventure, offbeat travel and amazing experiences on his blog. He also compiles travel tips, ideas and itineraries for his readers to plan a trip better."